Have you ever had a hard time getting out of bed? You know that feeling where you want to zone out that alarm clock that's buzzing for you to wake up and instead just drift back to sleep? 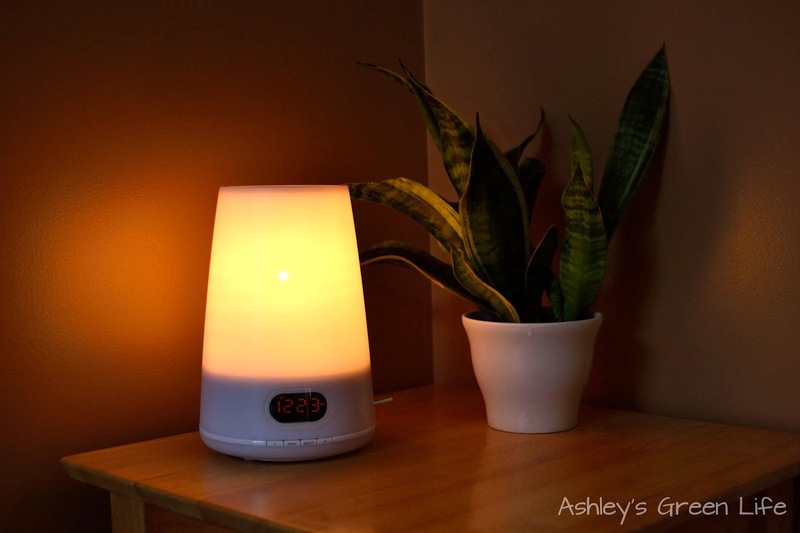 Well, I know I have from time to time, especially now that I've got kids, but did you know there may be a more gentle way to wake up that is not only better for your mood but also for your body? 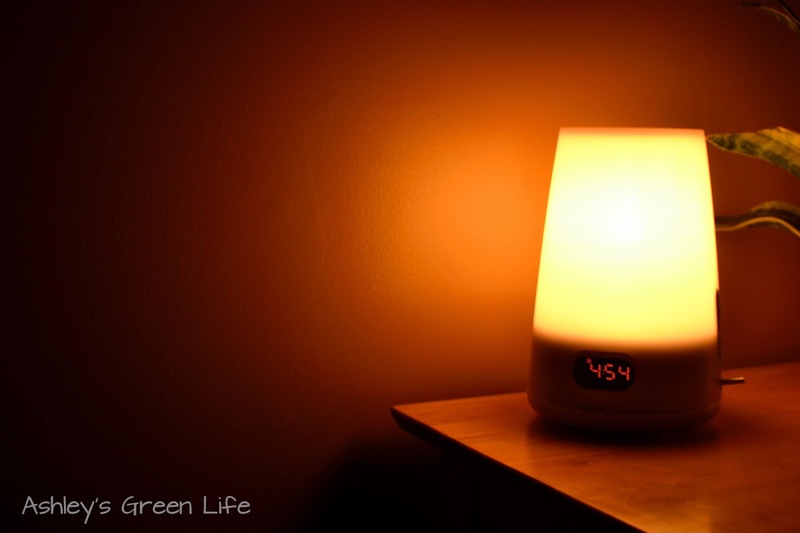 It's called a Philips Wake-Up Light and it's one of many types of light-therapy alarm clocks on the market today that wake you up with light instead of a blaring alarm sound. I've been using this Philips Wake-Up Light as my alarm clock for one year now and let me tell you, I will never go back to traditional alarm clocks. The way the alarm clock works is that 30 minutes before it goes "off" for you to wake up, a light starts to gradually get brighter, brighter, brighter until it's time for you to wake up. Then nature sounds (birds chirping) play quietly and gradually grow louder (over a period of 90 seconds) to wake you up, if the light already didn't. I know it sounds pretty out there and unnecessary considering it's price ($100), but it is so worth it for a number of reasons. ...to a lot of light when it's time for you to wake up! The idea behind it is... that bright morning sun, such as from a sunrise, energizes the body for the day and helps to regulate your sleep cycle. But during the winter months when there is less sunlight, more and more people have to wake up in the dark thus missing this dose of morning sun. As a result they may have trouble waking up, less energy throughout the day, and a decreased mood (aka grumpy time). This may also contribute to the "winter blues" that some people feel. Now seasonal changes aren't the only ones to blame, some people have work schedules that require them to get up before the sunrise anyways, so they may miss this energizing morning sunshine n matter what time of the year it is. I know I do. I get up at 4:45 AM every morning so that I can workout, prepare my food for the day, and now get two girls ready before I go to my job as a teacher. So even during the spring and fall, I still am up before the sun. Before we found this alarm clock, mornings were pretty rough. We were both groggy and tired because of the quick change from dead asleep in the dark to bright light bulbs. 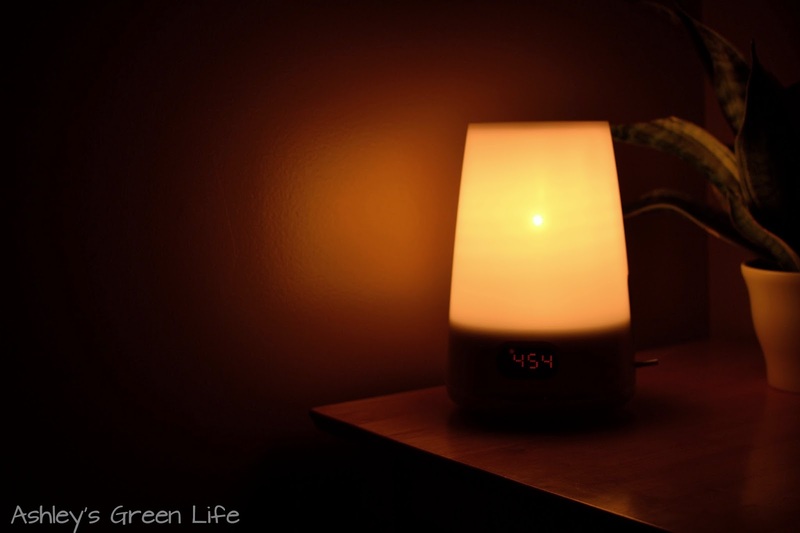 But with the Philips Wake Up Light, a UV-free light begins to brighten 30 minutes before your set wake up time, thus providing you (even though your eyes are closed) with 30 minutes of energizing morning light, the recommended dose The Sleep Foundation recommends for making it easier to get out of bed in the morning. 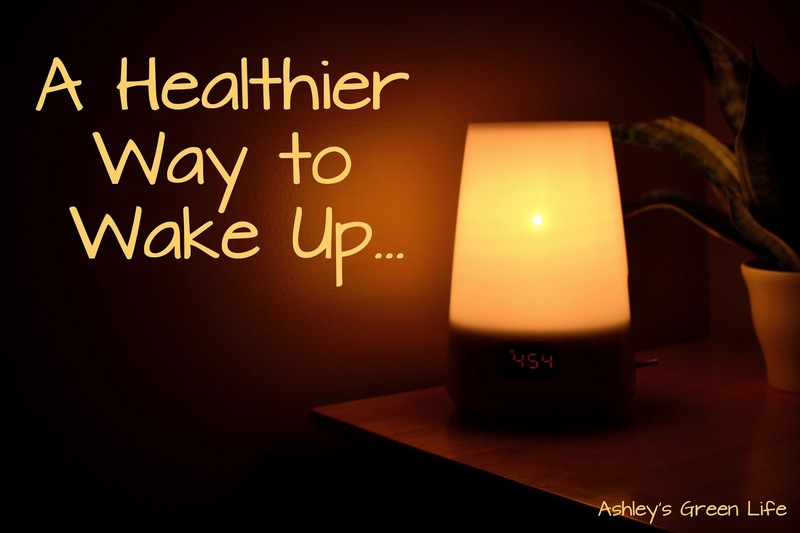 Once we started using the Wake Up Light...we found it was easier to wake up in the morning, we were both in better moods, and we felt like we had more energy first thing to start the day. Just a warning, the first time you use the alarm clock it may freak you out a bit...or maybe it was just me. I was super excited to give it a try so I set it and then in the morning when the nature sounds went off, I woke up saw the bright lights and started freaking out, "Did I leave the lights on? Why are the lights on? How could I fall asleep with all the lights on?!" Then it dawned on me...the alarm clock! Ohhhh....guess it's supposed to do that. Needless to say, I woke up a bit more peacefully the second morning and the many mornings that followed after that since I remembered the clock was just doing it's job. Now there are a variety of light-therapy type lights on the market, but this is the one I found on Amazon that I liked the best. And although the price may seem steep at $100, this is about the average price that they seem to run. On top of that it has over 1,000 customer reviews and was rated really high. You may find it helpful to go through and read some of those reviews, I know I found it helpful to hear about how it really helped improve the way other people woke up and other benefits they noticed with using the light. Also, the alarm clock using a replaceable halogen bulb just in case you're wondering. 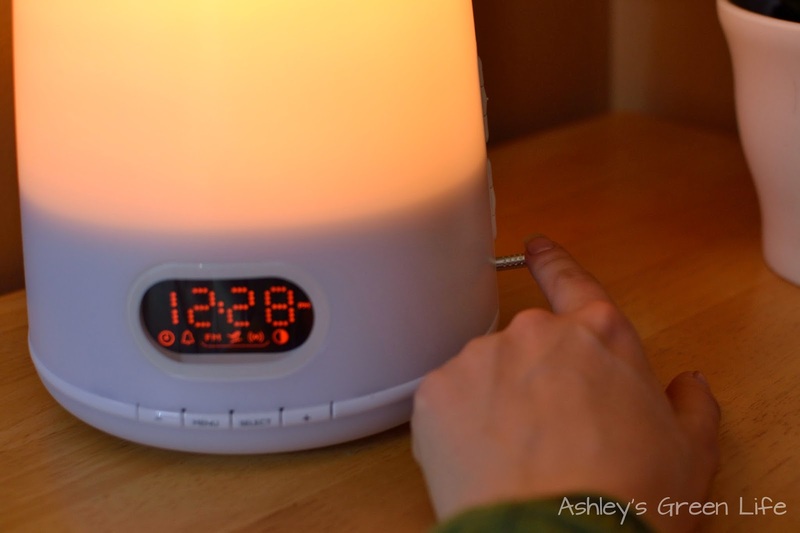 This light therapy alarm clock comes with a lot of ways for you to customize it to fit you. 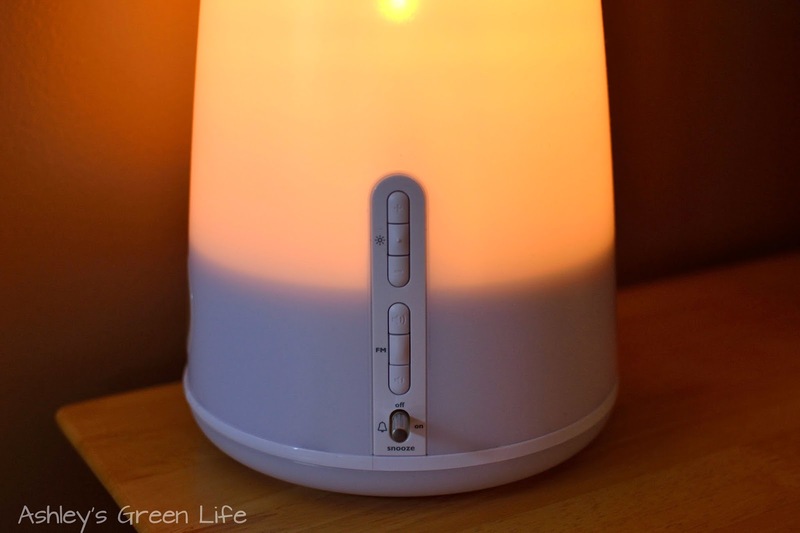 You can adjust the brightness of the light on a scale of 1-20 depending on how much light works for you, and you can also decide between chirping birds to wake you up or the radio, and you can choose the volume level of these sounds. of the light when it comes time to wake up. you will hear when it's time to wake up. when it goes off in the morning. One negative aspect about the alarm clock is... the question of what you should do if your partner has to get up at a different time than you. Right now Brandon (my hubby) and I get up at the same time, but in the summer when I'm off from teaching, I sleep later. I was worried about whether this light would wake me up to much at 4:45 AM and that I would have trouble falling back asleep, but it didn't. Now everyone is different, so it may affect you more, but you could try just putting the alarm clock closer to your partner who has the early wake up time, or you could tone down the brightness of the clock so that it's enough to wake them up but not enough to keep you from sleeping. Just to help you troubleshoot if you were to get one...you'll want to try out a couple different settings to see what you are most comfortable with. So if the light is waking you up too soon, you could turn it to a lower level of brightness or try moving it further away from you. On the flip side, if you keeping waking up to the sounds and never to the light, you could try increasing the brightness and moving the light closer to you or right at head level. We used to have our's on the floor and I found we needed a higher level of brightness to wake up to. But now that it's on an end table, at head level, right across from our bed, and so I've decreased our brightness just a bit so it doesn't wake me up too soon. So there you have it, my crazy, expensive, but very life-changing alarm clock! I love it and could never go back to a traditional alarm clock. Although it's one small aspect of my morning routine, I feel that it makes it easier to get up, I'm usually in a better mood, and I feel more energized and ready to start my day. 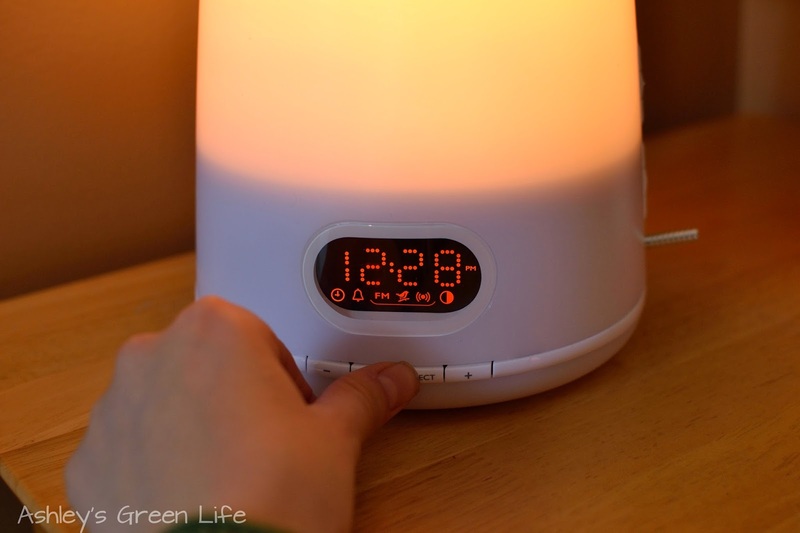 If you have any questions about the alarm clock post them below, or if you've ever tried a light-therapy-type alarm clock feel free to share your experiences as well. Here's to happier, healthier, greener mornings for all! Now that's a great improvement on the traditional alarm clock. I just found your site, Ashley, and I think it's great. I have a small blog as well - solar-power-now.com. I'm trying to spread the word - do you accept guest posts or can I buy ad space on your site? Please contact me on my site and let me know. Thanks.